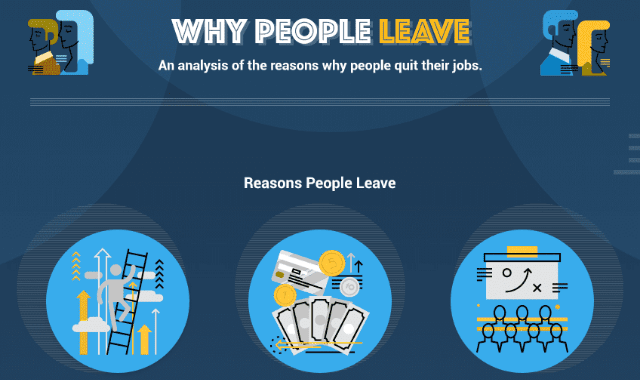 Why People Leave: An Analysis Of The Reasons Why People Quit Their Job #Infographic ~ Visualistan '+g+"
There are plenty of reasons why employees quit their jobs such as spouses leaving the country, needing to stay at home with their children or even their visa not getting renewed. It can be a tough pill to swallow for companies when someone hands in their resignation. However, a vast majority of the reasons why employees leave are under the control of the employer. Culture, team dynamic and meaningful work are all things employers can control. That means the best way to keep your talent is to stay in tune with how they’re feeling. Are they enjoying their job? Are they challenged enough? Do they work well with the team? Are they stressed? So we’ve listed the 5 main reasons why your employees are quitting and what you can do about it! Have a look below!